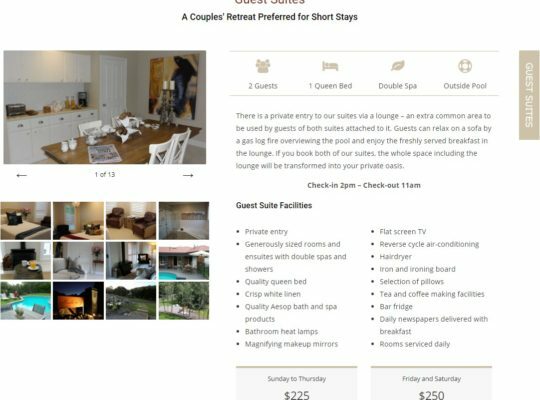 Arcadia in Rye was running an outdated website that did not reflect the looks of this stunning bed & breakfast accommodation venue in any way. We have redesigned the website and introduced a modern architecture and layout, new texts, sections, galleries etc. In the Things to do section, we have introduced some of the nearby locations and attractions to enable people looking for them and accommodation near them to find Arcadia in Rye. 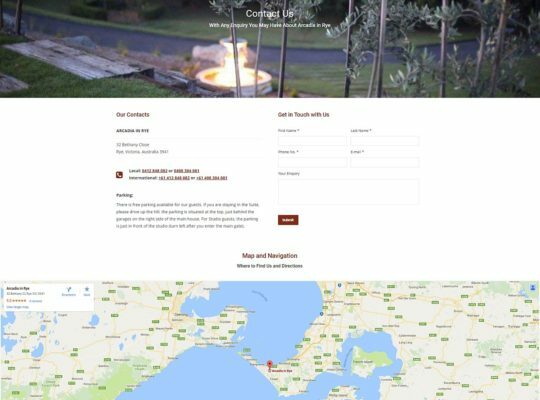 The new booking system enables the owners to manage bookings without the need of using a third-party booking only. Arcadia in Rye is a quality bed&breakfast accommodation specialising at romantic getaways for couples. 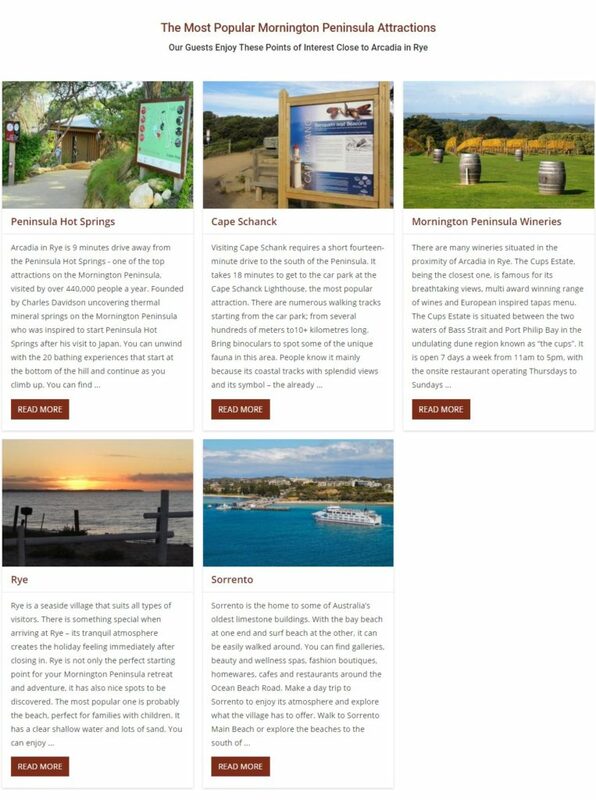 Its central location in the heart of the Mornington Penisula makes it an ideal starting point for trips to the local points of interest. 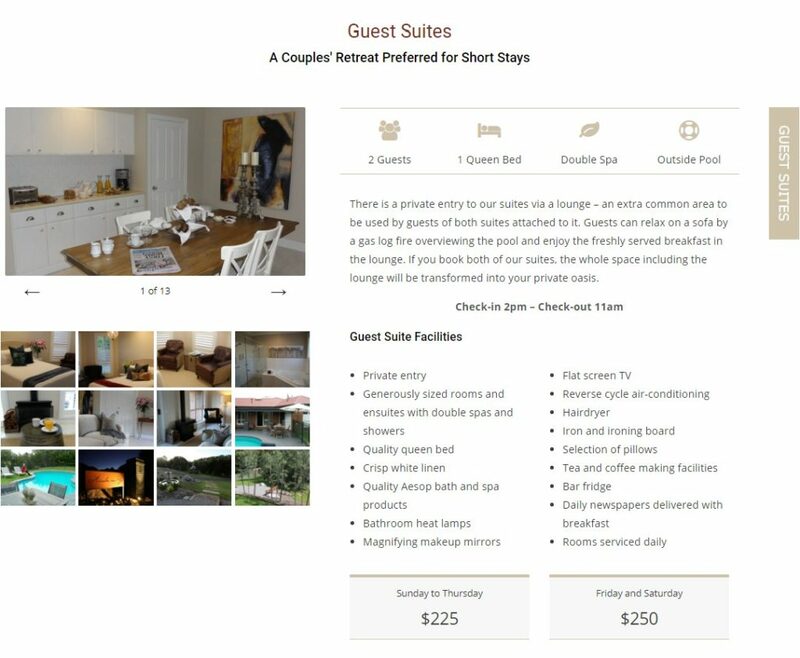 There are two accommodation options available: The first one is the Guest Studio, which is located in a separate building at the bottom of the grounds. It contains a kitchenette, double bath, dining area and a gas log fire. In the main house, two Guest Suites are available for guests with the access to a shared lounge with seating area and gas log fire. All guests can relax on the deck and have a swim in the outdoor swimming pool located at the top of the property grounds. The owners, Deborah and David, are fantastic and prepare a fresh locally sourced breakfast for everyone served either in the studio or in the lounge. 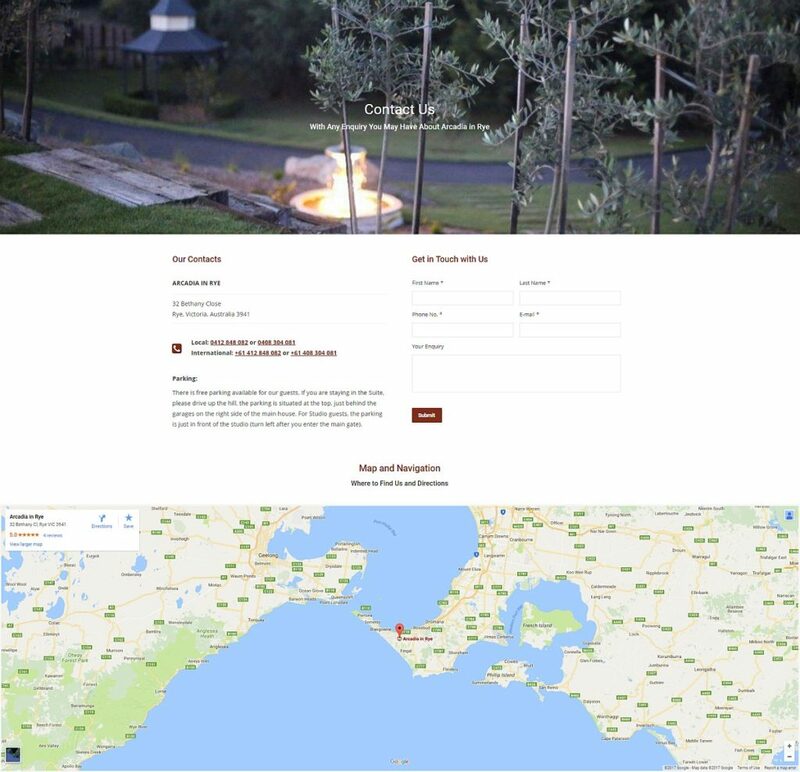 If you are looking for an accommodation that is close to Peninsula Hotsprings, local wineries (The Cups Estate, T’Gallant Winery), Sorrento or Cape Schanck, this is the place to go. And you won’t want to leave when your holiday is over. 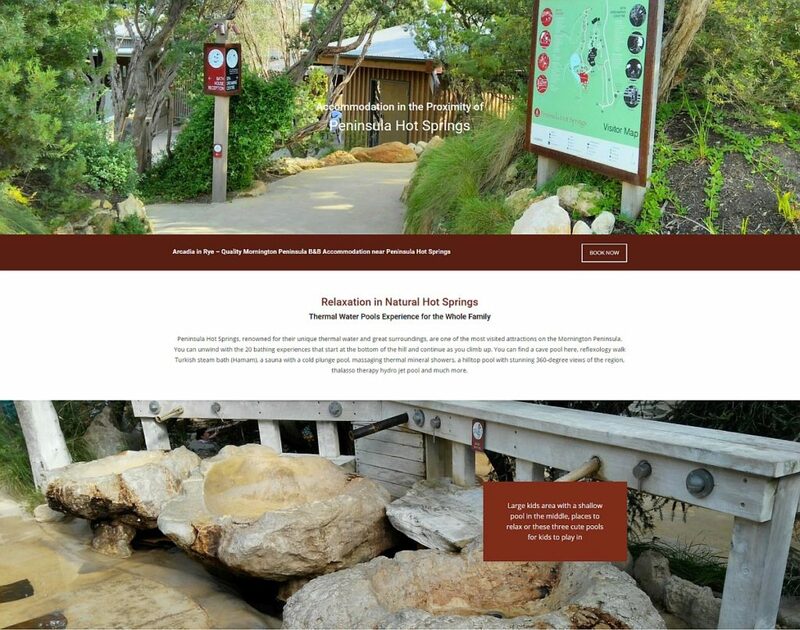 The existing website really needed improving. 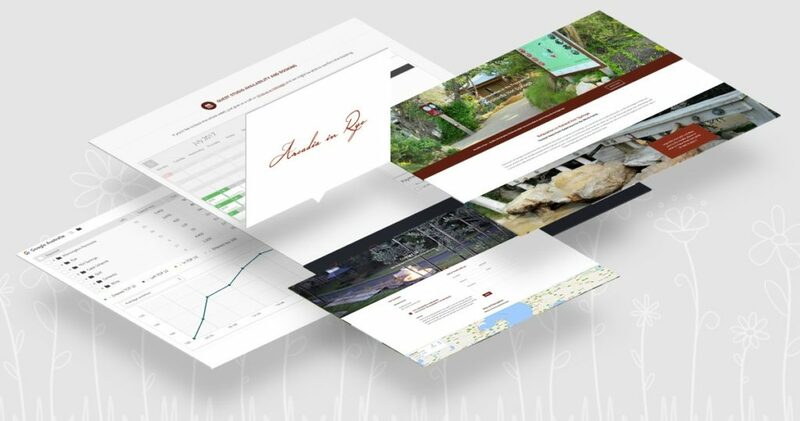 It had a basic outdated design and structure and contained a lot of errors including stretching images in the slider on the homepage. This made the whole work look unprofessional. After our suggestions, the owners Deborah and David signed up for a complete redesign. We changed everything except using the logo and “their” colours. 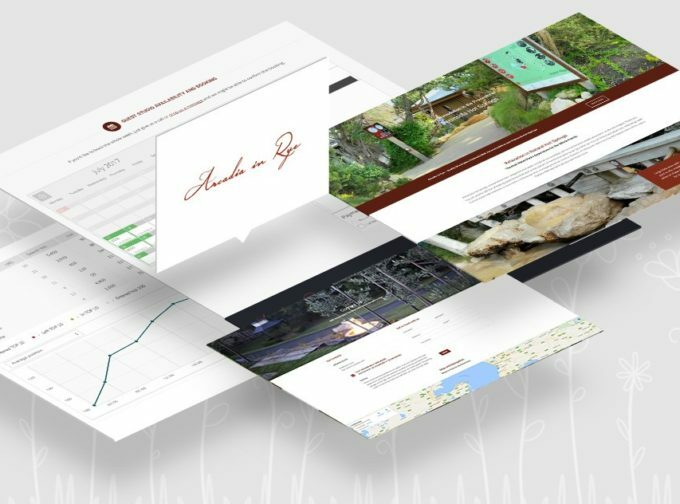 The new design is modern, spacious and enables us to present all the different types of content that have been created to support the information value for future and current guests and boost visibility in search engines. The old website has mentioned activities but only as a text within a few lines. 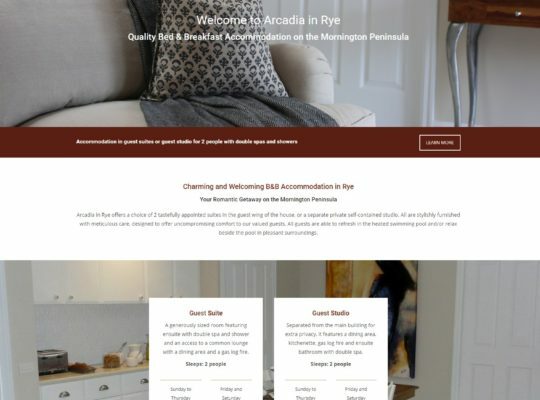 Within the new website, we created a section Things to Do which introduces ideas on spending time that is located in a close proximity to Arcadia in Rye. 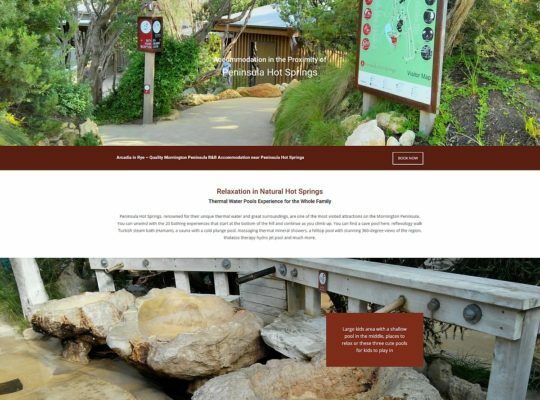 Visitors can view interactive map and access detailed descriptions and galleries for growing number of attractions. 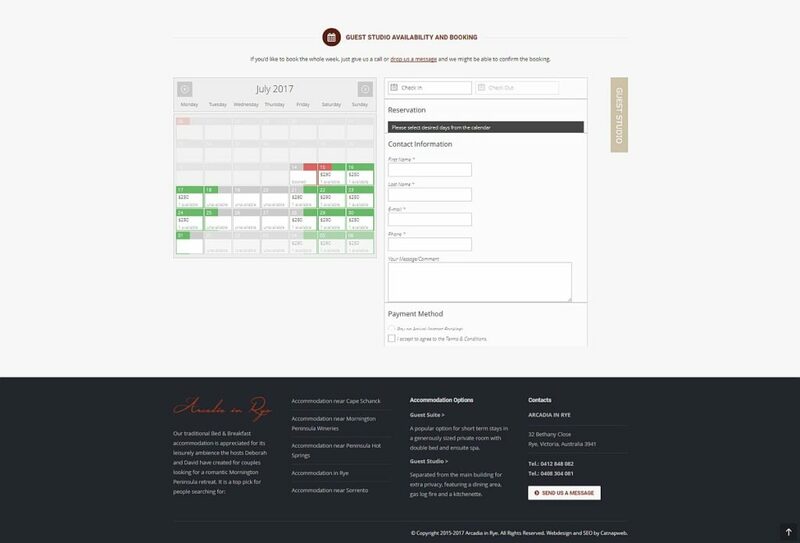 We have created a booking system that enables the owners to manage reservations for both Guest Suites and Guest Studio. Visitors can book one or two suites at once or they can decide to stay in the studio. 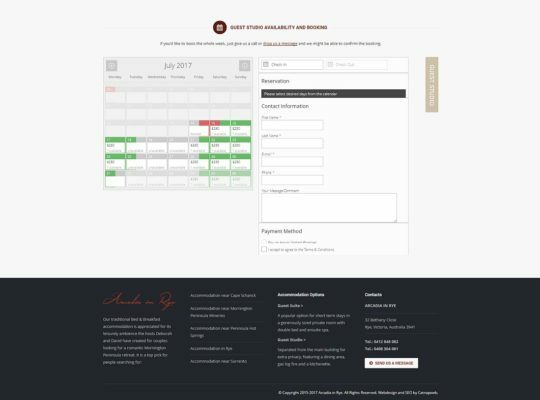 There is an easy-to-use availability calendar on the frontend for guests and the booking can be made in less than a minute. 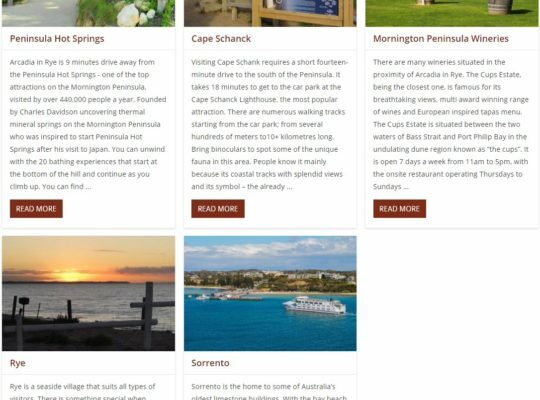 A simple and comprehensive booking system is used by the owners in backend. The old website was included in Google index but not visible at all. 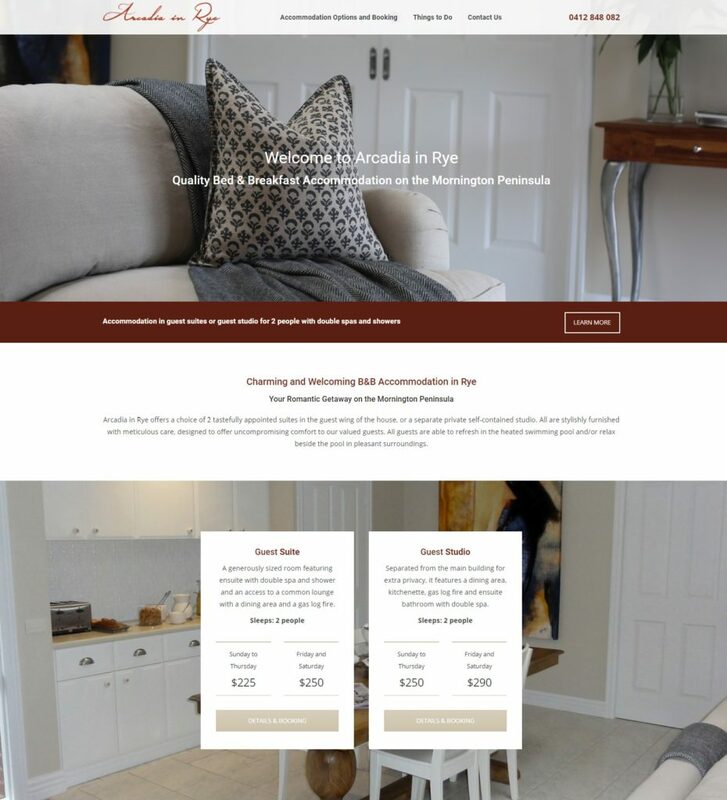 We defined 52 keywords that Arcadia in Rye should come up when search for and checked the visibility in Google Australia before swapping for the new website. The average position in search was 179 (18th page of Google). 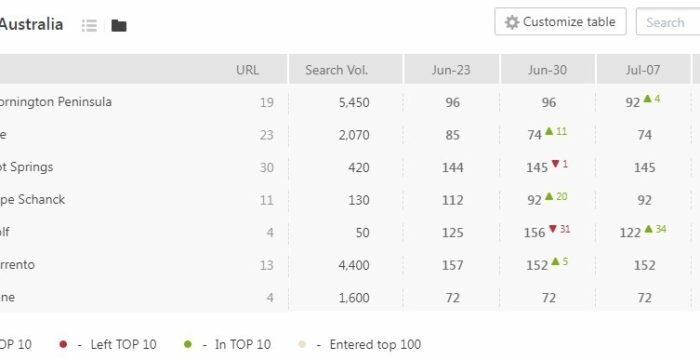 With the new website being optimised for these keywords, the average position has increased to current 107 (as per 18/07/2017 and still goes up). We have not committed to a full SEO project yet but have done some things to help SEO above the standard.